Use of electronic controls in the pressroom began decades ago. Before then, manufacturers were readily able to service nearly every aspect of what were more mechanical controls. This also is true of old machine controls that use relay logic—these units are serviceable with new relays when the originals no longer are available. Also, the ladder logic in these controls—what would comprise a program in a PLC—is physically visible, easing maintenance and repair. Fast forward to today. If an old PLC or solid-state control fails and you do not have a copy of the program, it becomes a black box. Repairing it is not a matter of simply replacing the parts; you also must replicate the logic circuit. Today we find that many of the older machine-control manufacturers no longer can service or provide parts for the PLCs they provided decades ago. Also, some manufacturers of production equipment have gone out of business. In this case, even if your controls aren’t that old, there may be no support for identifying the underlying logic required to operate the equipment. Manufacturers of PLCs support their components for only a defined lifespan. Any machine with a PLC control will therefore, at some point, be exposed to obsolescence. Most controls using dedicated solid-state controls also will have this problem. In addition, some older machines were designed with software that requires DOS-based computers or emulators to view and update. This can make repairs difficult if not impossible. Certain electronic boards may no longer be available. In many cases they have been rendered obsolete due to reduced volumes and excessive manufacturing costs, or as part of a marketing strategy to drive customers to more current products. Or, perhaps the original manufacturer has gone out of business and the technical data to reproduce the boards has been lost. • What parts of the press cells are vulnerable to the risk? • Where is the greatest risk? 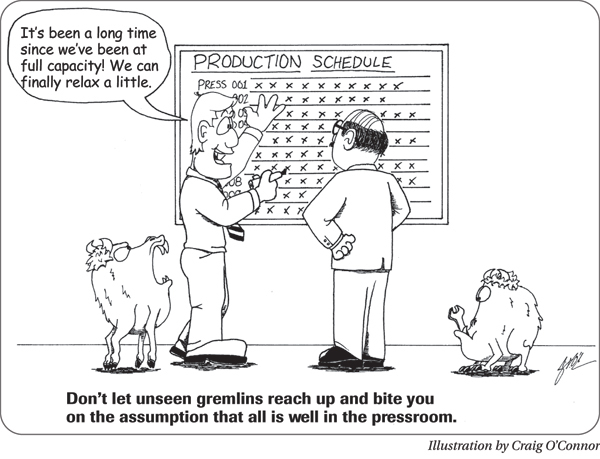 • What is the potential or likely length of lost production time? • How do we control this risk? Manufacturers of press feeds are quite busy these days retrofitting aging mechanical push-pull feeds with servo-feed control packages. Shown here is a retrofit completed by Coe Press Equipment, which included replacing the drive’s original rack-and-pinion mechanical system with a servo feed. Other typical updates include new pneumatic valves and cable sets, and a new operator interface. Solid-state and PLC-based mechanical-press controls are at very high risk of obsolescence. These are the machine controls that run the press itself, controlling all aspects of the clutch-brake safety circuit and other electrical devices on the press, such as press lubrication and slide adjustment. Not only do these units often contain aging electronic components, but today’s special safety requirements place a high burden on engineering and liability. These safety requirements can render stop-gap repairs potentially dangerous and ill-advised. Botched repairs can lead to grievous injuries. This added burden results in higher-priced replacement costs and typically longer lead times to produce the controls, configure them for the press, and install them. To make matters worse, nearly all press controls developed since the 1980s either are dedicated microprocessors or PLC-based, which means most will have some level of obsolescence risk. For small presses, lead times to receive replacement control components can stretch as long as four to eight weeks just to receive the hardware after the order. It can be much worse for larger presses, 800 tons and up, where lead times can be extended by an additional four weeks. This occurs because the larger press’s electrical cabinets, starters, drives and disconnects may not be off-the-shelf items, and can require custom fabrication or extended delivery delays. In addition, installation of the replacement components can easily take one to two weeks after the parts are delivered, assuming two experienced techs working full time on the installation. That timeline assumes the stamper already has the quotes prepared and has avoided delays in processing the order. Budget one or two weeks for preparing quotes. …start by looking at your most important presses, and contact the press-control manufacturer(s). Be aware that in some cases, the press and control builder are one and the same, and that some aftermarket press-control specialists are actually the control provider. Either the press builder bought the control from them when the press was built, or a later end user changed the original control to one available from the press-control specialists after having run the press for some time. If the investigation reveals a lack of support, begin to prepare for the worst by first asking: Should the control fail, is the press worth investing in? A “yes” answer implies that the machine is valuable, with a useful life ahead. In this case, go ahead and begin the investigation to identify the best aftermarket control provider to meet your needs, when the needs occur. Immediately prepare quotes for your most-critical presses—don’t wait until something breaks. Having this work done ahead of time can save weeks or months of downtime should an aging control fail. Also, be sure to investigate the support policies of your new or potential control vendors. Ask them how long they will support their product, to avoid future obsolescence issues. Older servo feeds, purchased in the 1980s and ’90s in particular, are likely to no longer be supported with new parts. Servo drives themselves differ from variable-speed drives in their ability to not only control motor speed and acceleration, but to also turn the motor a very precise number of degrees of rotation. This control function allows the feed to index the strip a programmed feed length. Press feeds represent a very specialized application of servo-drive technology. Stampers cannot simply purchase a new drive and motor package from a motion-control supplier. Specialized application knowledge and custom programming are required to apply the technology in a press-feed application. Lead times for servo-feed drive and motor packages can be as little as in-stock to four days, if ordered from one of the larger original equipment manufacturers. If the OEM cannot support the equipment, some of the larger servo feed suppliers offer drive packages to support equipment made by other manufacturers. In this case, though, quoting may take a bit longer if the supplier lacks complete documentation for the equipment. Mitigating risk begins as noted above. In some cases, a stamper can locate rebuilt drives or have repairs made using old parts sourced from used-equipment websites. However, as a better long-term solution, consider opting for completely new drive-motor packages, providing state-of-the-art features and ease of use with current hardware support. Again, request quotes sooner rather than later for critical equipment, to enable your pressroom to react quickly in the event of a breakdown. The risk of obsolescence is relatively moderate to low for straightener and reel drives, as its application in the pressroom is not as specialized as that found with servo feeds. The process of locating and installing equivalent-functioning straightener drives generally occurs more quickly and at less cost than that for servo feeds. In addition, little specialized programming is required to apply the drives, and many vendors offer suitable replacement products. Lead time to obtain replacement drives and motors for straighteners and reels generally is measured in days not weeks. In most cases, merely gathering the specifications for your equipment suffices—no need to obtain quotes from multiple vendors unless you’ll be relying on them to install the equipment. Lead time to secure replacement eddy-current drive controls generally is measured in days, and they’re relatively low-cost parts. While obsolescence can be an issue, in most cases the drive controls (or equivalent replacement controls from other manufacturers) are readily available. In some cases, repair shops can repair old controls, although the modest purchase price of new controls may make repair a sound solution only when the stamper needs a very quick fix. 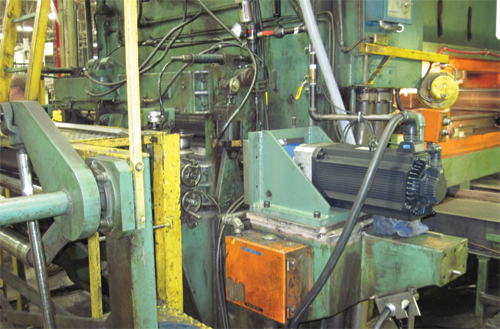 A caveat: While rebuilding eddy-current clutch-motor assemblies, may be possible, stampers can expect to wait longer than a few days for parts. Risk can escalate from low to moderate, or even to high, if the machine has a very high utilization rate and there’s no backup press available. Ensure your supplier(s) can support the speed controls being used. If not, investigate the part numbers of acceptable replacements. Additionally, for presses with very high uptime requirements, it may make sense—considering the pricetag for replacement controls—to keep a speed controller in stock on the shelf. Another option stampers should consider is converting to AC variable-speed drives, should the motor/clutch fail. Eddy current drives were the standard for presses for many decades, but have been steadily replaced with AC variable speed drives in the last decade. We see a lot of presses being outfitted with these drives, as there are several suppliers and, moving forward, prices and lead times for repair parts will continue to drop.